Recombinant fragment corresponding to Human WHSC1/NSD2 aa 30-146. 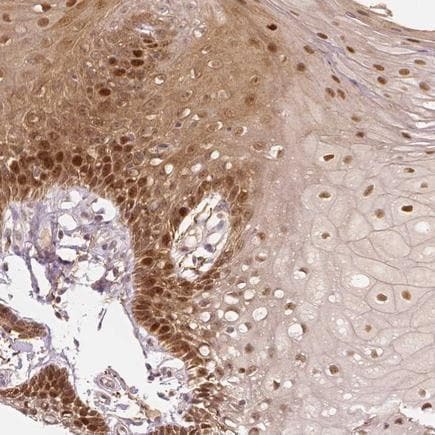 IHC-P: Human oral mucosa tissue. ICC/IF: A431 cells. Our Abpromise guarantee covers the use of ab223694 in the following tested applications. Probable histone methyltransferase (By similarity). May act as a transcription regulator that binds DNA and suppresses IL5 transcription. Note=A chromosomal aberration involving WHSC1 is a cause of multiple myeloma tumors. Translocation t(4;14)(p16.3;q32.3) with IgH. Note=WHSC1 is located in the Wolf-Hirschhorn syndrome (WHS) critical region. WHS results from by sub-telomeric deletions in the short arm of chromosome 4. WHSC1 is deleted in every case, however deletion of linked genes contributes to both the severity of the core characteristics and the presence of the additional syndromic problems. Contains 4 PHD-type zinc fingers. Paraffin-embedded human oral mucosa tissue stained for WHSC1/NSD2 using ab223694 at 1/50 dilution in immunohistochemical analysis. 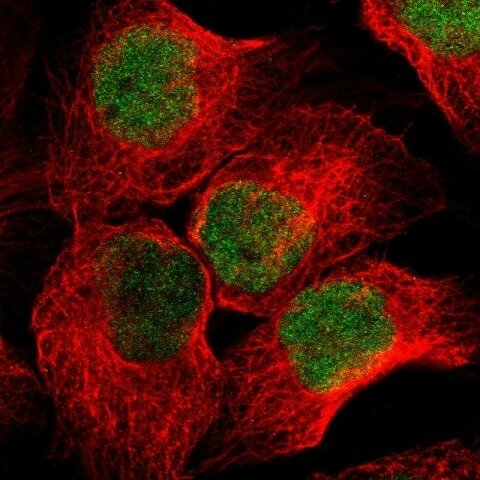 PFA-fixed, Triton X-100 permeabilized A431 (human epidermoid carcinoma cell line) cells stained for WHSC1/NSD2 (green) using ab223694 at 4 µg/ml in ICC/IF. ab223694 has not yet been referenced specifically in any publications. Publishing research using ab223694? Please let us know so that we can cite the reference in this datasheet. There are currently no Customer reviews or Questions for ab223694.